YOU WON’T FIND SPREADING PINES AND DESERTED BEACHES LIKE THE ONES IN COMPORTA ANYWHERE ELSE IN EUROPE. WITH TIME, THE DESIRE TO RETURN HERE WILL ONLY GROW, NO MATTER HOW MUCH YOU TRY TO DISTRACT YOURSELF WITH OTHER PLACES AND VIEWS. 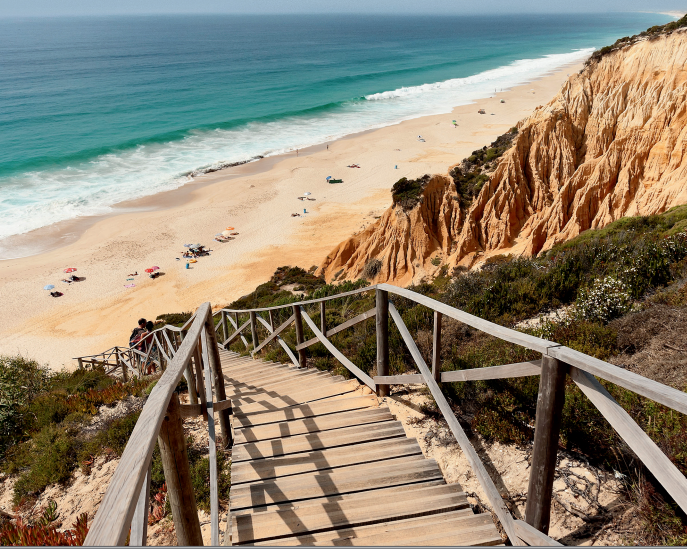 The coastal land south of Lisbon, beyond the city of Setubal, is often called Comporta. Technically, however, Comporta is a freguesia (parish) of the municipality of Alcácer do Sal, with its capital in the fishing village of the same name. Having turned into a fashionable resort over the last few decades, Comporta has spread its name to the surrounding protected areas. With the exception of singlestorey villas, there is no development under way here, so the hills and plains, covered with low branching pines and green grass, appear untouched. Take a closer look, and beyond the pines you will notice rice fields and plantations of valuable cork trees, which seem as if they were made for this place. The village of Comporta is no more than a few streets with low houses, their chimneys crammed with storks’ nests that resemble tall fur hats. In the evenings, the inhabitants of the surrounding villas converge on the local shops and restaurants, to have dinner at the hipsterish Cavalariça or buy something exquisitely unnecessary at Lavanda and Côté Sud. Driving 20 kilometres to a restaurant, beach or supermarket is completely normal by local standards. Off the lively central street, on the road that leads to the ocean, stands a building resembling a hangar, with a large sign that can be made out from afar: Museu do Arroz. If you want a table here, in the area’s largest traditional Portuguese restaurant, you need to book ahead. From the terrace you can admire a flooded rice field with its whirling mosquitoes, the true proprietors of these parts. Fried rice balls, tiny octopuses stewed in fragrant sauce, thick soup with rice and chunks of fish, braised beef cheeks and molluscs in Alvarinho wine or, even better, 10-year-old port: dinners here go on for hours, and there are few evenings spent in Comporta that do not revolve around unfettered bacchanalia. 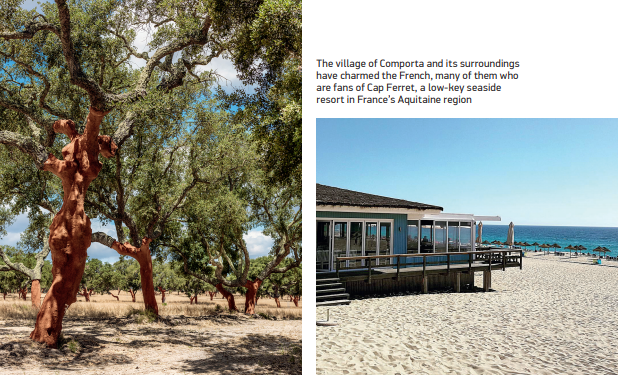 But Comporta’s bons vivants don’t go into town every day: all of the best dinners and parties unfold behind the gates of the villas, on vast designer terraces, and by pools under a starry sky. In the mornings, before the heat sets in (the Portuguese sun is merciless and getting sunburn is easy, especially since the cool winds make it difficult to recognise that you’ve been burnt), holidaymakers stroll along the dunes, collecting shells. From time to time they approach the ocean, so that the oncoming waves drench them from head to toe. They swim and ride paddleboards in a salty estuary separated from the ocean by a narrow isthmus. In the beach bars the drink of choice is galão, local coffee with milk served in glass tumblers. After noon, people doze on chaise longues by the ocean or in hammocks on their extensive properties. Every now and again, tired of a measured life, they head off to Lisbon. You can reach the centre of the capital from Comporta in just over an hour by driving along an empty highway and then over one of thebridges across the river Tagus: the futuristic Ponte Vasco da Gama or the Golden Gate lookalike Ponte 25 de Abril. 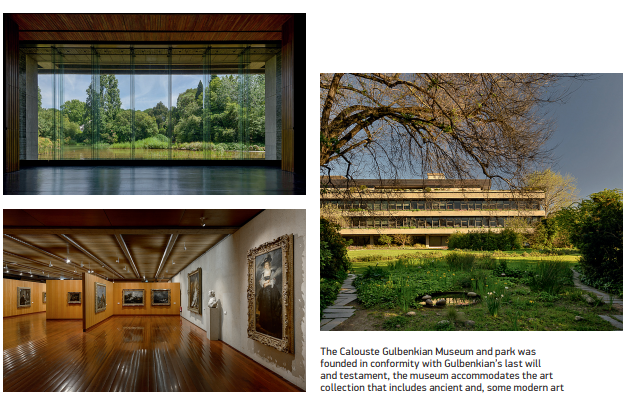 Begin your weekend in Lisbon at the Calouste Gulbenkian Museum, surrounded by a tropical garden with large numbers of waterfowl and tortoises, bamboo groves and cosy open-air cafés. If you’re lucky, it will rain. In rainy weather the museum grounds are the best place to be in Lisbon. Here you can spend a whole day: inspecting the collection, taking a walk in the garden, sitting in the library, having coffee with pastries on the verandah. The exhibition halls of the museum are home to more than 6,000 items from the vast Gulbenkian collection, part of which the billionaire and philanthropist oil magnate gave to the British Museum and the National Gallery in London. The story of Calouste Sarkis Gulbenkian, who became a Lisbon attraction in his own right while still alive, is linked not only with Turkey, Britain, Egypt, France, and Portugal, but also with Russia — he acquired several of the canvases, specifically paintings by Rubens and Rembrandt, from the Hermitage. The museum’s extensive collection is displayed in the spacious halls in such a way as to give visitors the impression they are strolling through an inhabited home. Besides Western European painting and Ancient Egyptian artefacts, there is plenty of unique furniture on show, particularly the opulent Boulle wardrobes, table silverware and René Lalique ornaments. It’s a place that’s difficult to leave. If you want to linger in the area around the museum a little longer, why not have lunch in one of Portugal’s best Japanese restaurants, Go Juu — it’s right opposite, on the other side of the road. Another stately home, the Palácio Belmonte, happily still fulfils a residential function as its owners have transformed it into a hotel. The oldest palace in Portugal, it sits on a hill in the very centre of the city, not far from the Castelo de São João. Wandering through its halls and admiring the views from its terraces, it is easy to imagine yourself as the scion of an ancient aristocratic family. And your imagination will finally run wild if you stay in Palácio Belmonte for the night, as some do. 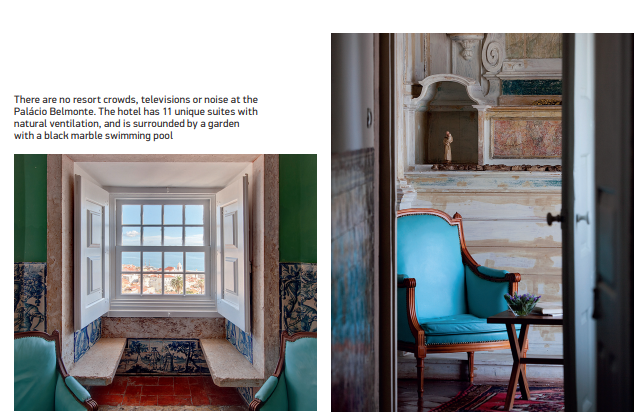 The most beautiful bedroom, with a view of the Tagus, is located in the palace’s tower and decorated with traditional azulejos, blue-andwhite tiles depicting scenes from the life of the Portuguese nobility. The palace was built more than 500 years ago above the bay of Mar da Palha on the site of a former Roman and Moorish fortress, and incorporated defensive towers on foundations dating back to 123 B.C. into the building. It was later added to, acquiring terraces overlooking the Tagus and new facades, and in the 1720s two masters in the creation of azulejos, Manuel dos Santos and Valentim de Almeida, decorated the walls of several chambers with the distinctive blue-and-white panels. Look at them closely and you can learn a lot about the everyday life of those who lived in the palace (one of these panels can be found in the bedroom mentioned above). The palace survived the earthquake of 1775, which destroyed most of Lisbon, and has been recognised as a national monument ever since. Staying in one of the distinctive rooms, none of which resemble each other (in reality these palatial apartments have little in common with hotel rooms), you experience a strange sense of being immersed in the history of a oncegreat nation. Vasco da Gama’s return from India was celebrated within these walls, numerous prominent royals slept here, and the Italian actor Marcello Mastroianni strolled these halls while filming the Roberto Faenza picture According to Pereira in the mid-1990s. From the Palácio Belmonte, half an hour of leisurely walking will bring you to the Mercado da Ribeira. One of Lisbon’s old markets, it has been transformed into a fashionable food court called Time Out Market, but has lost none of its former charm. Here you can while away the hours, morning or afternoon: start off in Manteigaria with a coffee, naturally accompanied by Portugal’s iconic native pastry, the pastel de nata. Then amble past the fish and vegetable stands, choose a madeira or bottle of 20-year-old port, and park yourself firmly in one of the cafés. At Tartar-ia they make the tastiest of tartars from salmon and tuna, beef and even herring (the latter distantly resembles the Jewish dish forshmak), with light, often Asian, dressings. The wine list is small but masterfully curated, so things are not usually limited to tartare: take a new dish with each glass. However, it’s not a good idea to overindulge, otherwise there will no space left for fried octopus and bacalhau and potato cakes — one of Portugal’s main specialities — along with other snacks, or petiscos, sizzling in the pans in the nearby restaurants. Once you’ve picked up some bottles of wine with cheery labels, chocolate, fruit and flowers, it’s time to set out on the way back to Comporta. After the noise and bustle of Lisbon there’s no better place to find peaceful solitude than a chaise longue by the pool at your villa, where the peace is only disturbed by bumblebees flying from flower to flower and the rippling of water. The giant red sun sets beyond the ocean, and one after another the stars begin to twinkle in the sky. Family and friends gather around an enormous table in the living room. The evenings in Comporta are not that different from those enjoyed at summer houses around the world: here the holidaymakers drink tea with rice pudding and play cards or games, accompanied by a glass of strong liquor made from the fruit of the strawberry tree. Some lounge around on the sofa with a book, others turn in early for the night. This is the villa lifestyle, and it doesn’t really matter where it happens, in the suburbs of a large city — or on the coast just south of Lisbon.